Fido has informed customers its FidoREWARDS program is coming to an end, with the last day to earn FidoDOLLARS set to take place on April 6, 2016, with the last possible day to redeem dollars set for July 6, 2016. 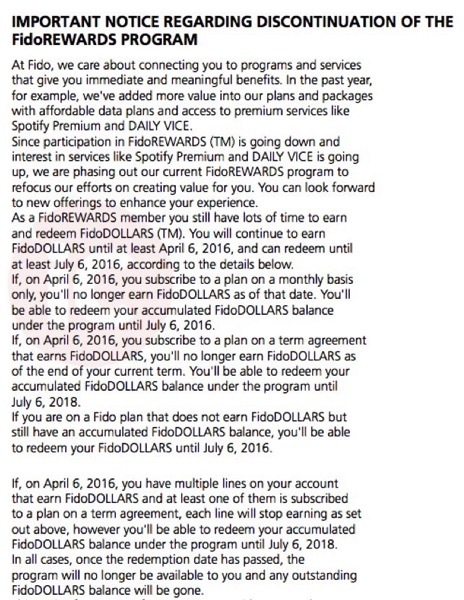 The notice was added to the third page of Fido customer e-bills, titled “Important notice regarding discontinuation of the FidoREWARDS program”. 1. FidoREWARDS members, if subscribed to a monthly plan as of April 6, 2016, will no longer earn dollar rewards—and be able to redeem dollars until July 6, 2016. 2. If on April 6, 2016, you’re on a term agreement that earns FidoDOLLARS, “you’ll no longer earn FidoDOLLARS as of the end of your current term,” and will be able to redeem these rewards until July 6, 2018. 3. For those on Fido plans that do not earn FidoDOLLARS, but have a balance, they will have until July 6, 2016 to redeem these dollars. The bottom line—no matter what happens, if the redemption date passes, your FidoDOLLARS will be gone as the program will end. Users have been able to apply accumulated FidoDOLLARS to new contracts to reduce the initial cost of smartphones. Looks like Rogers, the parent company of Fido, no longer wants this to happen as they lose out on cash up front when people are upgrading. Last March, Fido ended the program for customers when they made changes to their plans. FidoDOLLARS allowed customers to earn 4% of their bill every month. Are you sad to see the end of Fido dollars? 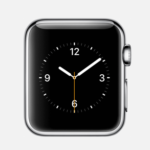 How many dollars do you have accumulated so far?